Guests can stay in either our large indoor 150 x 60cm Rhubarb or 145 x 60cm Purple Pansy rooms that are in our brick outhouse attached to the main residence. The room is air conditioned for hot days during the summer and heated for cold days during the winter and temperatures are kept to around 20 degrees through these seasons to keep piggies comfortable. Indoor runs are also available for exercise when the weather does permit exercise outdoors. All piggies are fed fresh vegetables, dried food and hay daily. Burgess Excel dried food is kept in stock, if your piggie eats a different dried food, then we encourage you to bring this food with you when you drop your piggies off along with any toys etc that they are familiar with to help them settle in. 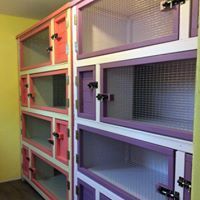 Hutches are cleaned regularly with full bedding replacement. Happy to administer medication if required. Due to the Data Protection Act, it is advised that owners inform their vets that their piggie are staying with me should a matter arise that they are required to be taken to the vets. Prices per day start from only £7 for the first piggie and £1.50 for each additional bonded piggie sharing the same cage. Apart from a small additional boarding fee on Christmas and Boxing Day there are no additional boarding fees for bank holidays. Nail clipping is offered free of charge for any piggies that stay with us. 2 doors past Crane Park Primary School with green outside the front garden, also not far from the A316.